Although Canadians can enjoy the great outdoors in their own backyard, there are plenty of reasons to consider taking a hike in Switzerland. According to Ursula Beamish-Mader, manager, media relations North America for Switzerland Tourism, breathtaking nature, a dense network of hiking trails, a variety of experiences from flat hiking to a more extreme adventure amongst the Alps, and its well-connected infrastructure easily linking travellers to hiking paths across the country are just a few of the reasons why Switzerland aims to prove it’s the No. 1 hiking destination in the world. In total there are 65,000 kilometres of marked hiking trails so travellers can’t get lost and trails virtually start on the front steps of hotels. While they are not new, she said the destination is promoting three trails in particular, with luggage transfers and hotel options along the routes. There’s the classic Via Alpina, part of a larger trail which transcends from Slovenia to the Iberian islands. On the easy side, there’s the Jura Crest Trail, dating back to 1905, and then there’s the wild one, The Alpine Pass, which takes up to 20 days to complete, should one be so inclined. 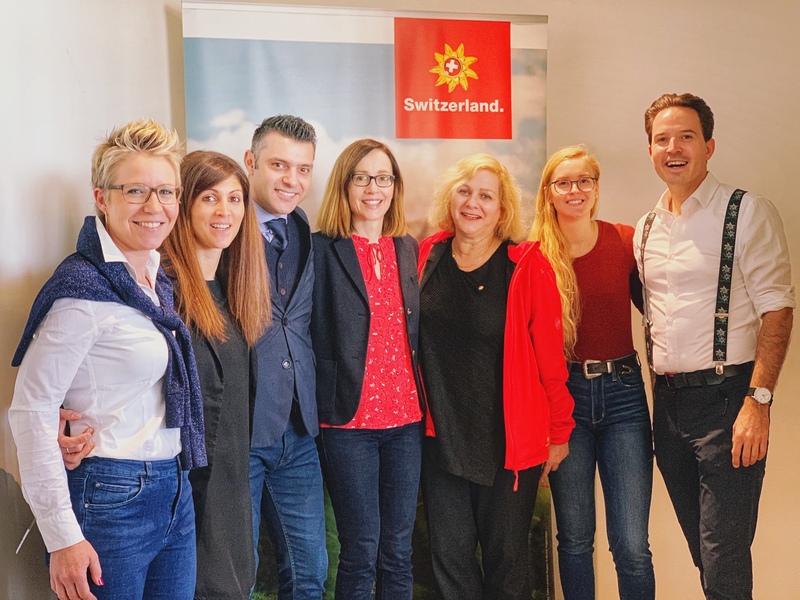 Centered around Switzerland Tourism’s “Year of Hiking” theme, a delegation of Switzerland travel partners gathered from SWISS, Rail Europe, Zurich, Ticino, and Basel gathered in Toronto yesterday (April 9) as part of a North American tour promoting the Best of Switzerland. 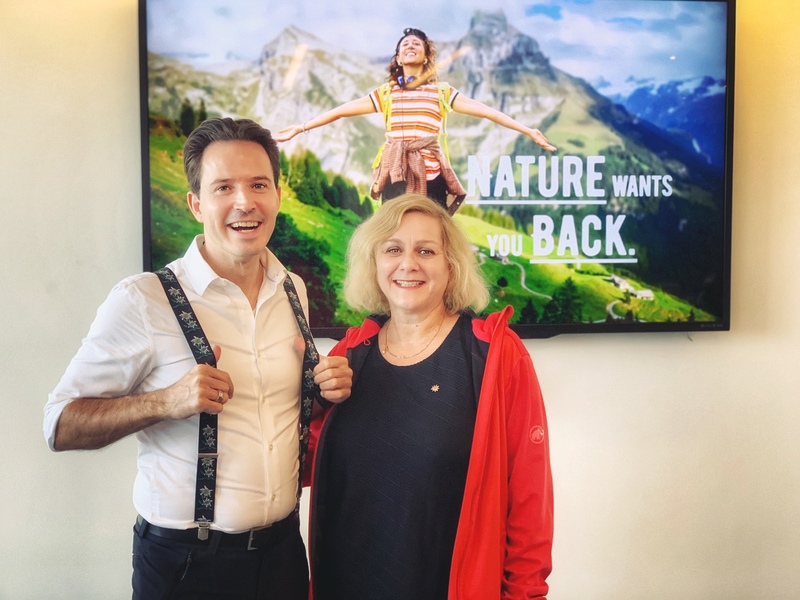 Sporting his finest edelweiss suspenders and proclaiming “this is the real Pascal,” Pascal Prinz, director Canada and trade manager Central USA for Switzerland Tourism, announced another record year for Canadian travel to Switzerland in 2018 with the best overnights in 25 years. Ontario remained the largest market, followed by Quebec, with a strong increase from Western Canada as well. “We have momentum and we want to keep it going,” he said, adding that there is even more connectivity this year from Toronto, Montreal and Vancouver. Chris Wendland of the Lufthansa Group, which includes SWISS and Air Canada, said SWISS provides a taste of Switzerland for all guests on board, rotating menu items from different cantons throughout the year. “Everything we do on the ground and in the air reflects the SWISS product and values, which is top of the line,” she said, adding that the Toronto service is on Air Canada’s Dreamliner. With the Swiss Travel Pass, an all-in-one ticket to travel via train, bus and boat in the destination, Rares Dumitru, regional sales director for Rail Europe said travelling across Switzerland is a breeze. “From the moment you arrive, you can go to every corner of the country,” he said. Of note, Dumitru mentioned the pass is now available electronically so travellers can keep their ticket on their mobile devices instead of a printout, which can get lost or stolen. In the city of Zurich, area manager of the Americas, Aurelia Carlen of Zurich Tourism, announced that design and art are a big focus for 2019 and 2020. This spreads not only to museums but across 400 works of art in public spaces, which can be discovered along three new art walks available in three different parts of the city. Zurich is also a hotbed for festivals like the Zürcher Theater Spektakel, an international festival now in its 40th year, and Food Zurich, which has quickly become the biggest food festival in Switzerland. Over in Basel, Anneke Geyer head of public relations at Basel Tourism, said the whole city is about art. Not only is it home to the oldest public art collection dating back to 1661, but a modern take can be found in the form of a Bentley turned into a rolling piece of art by a local class. The city is also renowned for its Art Basel festival, which has international spin-offs in Miami Beach, Florida, and Hong Kong. Finally, in Ticino, the Italian speaking region of Switzerland, Veronica Lafranchi, country manager overseas for Ticino Tourism, said travellers can experience views of both the highest and lowest points in the country, side by side. The food is also noteworthy, she said, adding it has a rich cuisine with Michelin-star restaurants and Italian influence. Another unique option is the white merlot produced in the canton. (At top) Anneke Geyer, Basel Tourism; Veronica Lafranchi; Basel Tourism; Rares Dumitru, Rail Europe; Aurelia Carlen, Zurich Tourism; Ursula Beamish-Mader, Switzerland Tourism; Ludivine Chappuis, Switzerland Tourism; and Pascal Prinz, Switzerland Tourism. (Middle) Pascal Prinz and Ursula Beamish-Mader.